Rear Air to Coil Spring Conversion Kit for Ford, Lincoln, Mercury. This is a Rear Air Suspension to Coil Spring Conversion Kit (4 Pieces) for a Ford Crown Victoria, Lincoln Town Car, and Mercury Grand Marquis. It includes 2 Coil Springs to replace the air springs, and 2 rear Sensen Shocks. Cross reference numbers include KYB: 343135, Monroe: 5961, TRW: CC837, Arnott: C-2232, and ELGIN: MC865. APX set number is 1360-RCS. Please consult the compatibility table above for the correct fitment for your specific vehicle. ARE YOU TIRED OF BEING QUOTED OUTRAGEOUS PRICES AT THE REPAIR SHOP FOR COMMON REPAIR PARTS? WE HAVE TALKED TO THOUSANDS OF CUSTOMERS THAT HAVE OLDER, HIGHER QUALITY CARS WHO ARE TIRED OF BEING CHARGED THE PRICE OF A USED CAR FOR A COMMON REPAIR PART. WELL, YOU DON'T NEED TO LOOK ANY FURTHER THAN APX AUTO PARTS. AUDI, BMW, JAGUAR, MERCEDES, VOLVO AND OTHER POPULAR MAKES. SUPPLY IS LIMITED, SO GET YOUR ORDER IN TODAY! 2 Hardened Rods & NOK Seals. Struts fail when they leak their internal fluids and gases. These failures are most often a result of inferior rods and seals. That is why we use a combination of high-quality carbon steel rods with a hardened chrome finish and superior Japanese-made NOK seals. Believe it or not, there are some strut manufacturers that are still using human labor for welding. Our reputation for consistent quality is rooted in our state-of-the-art manufacturing processes, which consists of precision robotic welding in almost all applications. It is very important to have a premium powder-coated finish for long lasting corrosion and rust protection. The "premium" brands manufacture their struts in several second and third-world nations throughout Asia and Latin America. Our shocks and struts are manufactured in the same facility for enhanced consistency and quality control. Each SENSEN shock and strut is individually tested before leaving the factory. 7 Benchmark-tested to the Industry Leader. We benchmark test for quality and performance against the industry leaders. 8 OE Supplier to Volvo, Audi, and Volkswagen. Sensen Shocks & Struts is an OE supplier to domestic China for Volvo, Audi, and Volkswagen. The Sensen manufacturing facility has ISO 9001 and ISO/TS 16949 certifications. The International Organization for Standardization provides 3rd party certification to factories who meet extensive quality management standards. 10 Manufacturing Struts since 1985. You are not taking a risk on a product that hasn't been tried and tested. Sensen has a 30 year history of manufacturing quality shocks & struts. APX warrants that our products are free from defects in material and workmanship when in normal use and service of the vehicle on which it was installed. APX DOES NOT ACCEPT ANY LABOR CLAIMS. Our company and product liability is strictly limited to the replacement of the unit once APX has determined it to be defective. APX Autoparts Express is proud to offer you the best price and fastest service for all your aftermarket parts needs. In order to keep our prices low, we require all buyers to adhere to the following terms and conditions. Make sure to provide a physical address when placing your order, or the order will be cancelled. For other US States and Territories - Extra Charges Apply. Occasionally, due to high demand, we may be out of stock on an item. We have a different model when it comes to the auto parts industry. We have a direct connection to the factories that supply our auto parts. This allows us to provide a different customer experience that results in the development of long term relationships with our customers. That customer experience consists of several key elements. US - based customer service. We just want to say thank you for considering us as your favorite automotive parts supplier. We want to replace it with a comfortable shopping experience. That is one where you speak to a human and are treated like a customer should be treated. We hope that our story gives you comfort about who we are and how you will be treated. Powered by Solid Commerce The All-in-One Listing, Inventory & Order Management Solution. 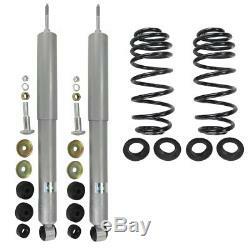 The item "Rear Air to Coil Spring Conversion Kit for Ford, Lincoln, Mercury" is in sale since Monday, May 12, 2014. This item is in the category "eBay Motors\Parts & Accessories\Car & Truck Parts\Suspension & Steering\Shocks & Struts". The seller is "apxautoparts" and is located in Wilmington, North Carolina. This item can be shipped worldwide.